Tobacco-Related Diseases - body, causes, What Is Tobacco-Related Disease? Tobacco-related diseases, including lung disease, heart disease, stroke * and cancer * are illnesses caused by tobacco use, the leading preventable cause of death in the United States. * stroke is a blocked or ruptured blood vessel within the brain, which deprives some brain cells of oxygen and thereby kills or damages these cells..
Where there is smoke, there is disease. Tobacco use is the leading cause of preventable death in the United States. It leads to more than 430,000 deaths each year, or one in every five deaths. Hundreds of studies have found that cigarette smoking can cause lung disease, heart disease, and stroke. Smoking also can cause cancer of the lung, mouth, larynx * , esophagus * , and bladder * . In addition, it plays a role in cancer of the cervix * , pancreas * , and kidney * . Smokeless tobacco and cigars can have deadly results, too, including cancer of the mouth, larynx, and esophagus. The harmful effects of smoking do not end with the smoker. Women who smoke during pregnancy are more likely to have babies with a low birth weight, a leading cause of death among babies. Nonsmokers are affected by secondhand smoke, also known as environmental tobacco smoke, which is smoke from other people's cigarettes. Each year, secondhand smoke kills about 3,000 nonsmokers in the United States by lung cancer. It also causes up to 300,000 children to get infections of the lower airways and lungs. In addition, there is some evidence that secondhand smoke may increase nonsmokers' risk of getting heart disease. Who Uses Tobacco, and Why? Tobacco eventually leads to death or disability for half of all regular users. Nevertheless, about 47 million adults in the United States smoke cigarettes. Four out of five adults who ever smoked began by age 18. This means that students who stay smoke-free through high school probably will never light up. Young people who start smoking are more likely to get low grades in school than nonsmokers. These students often have low self-esteem, and they may turn to smoking because they think it will make them more attractive or popular. Because such teenagers lack self-confidence, they may have trouble saying no to tobacco. * larynx (LAR-inks) a structure in the throat, composed of muscle and cartilage (CAR-ti-lij) and lined with a mucous membrane (MU-kus MEM-brayn), that guards the entrance to the windpipe and contains the vocal cords. * bladder (BLAD-er) is the sac that stores urine produced by the kidneys prior to discharge from the body. * cervix (SER-viks) is the lower, narrow end of the uterus (YOO-ter-us), the organ in females for containing and nourishing the young during development in the period before birth. * pancreas (PAN-kree-us) is a large gland located behind the stomach that secretes various hormones and enzymes necessary for digestion and metabolism (me-TAB-o-liz-um), notably insulin. Who smokes cigarettes in the United States? According to federal figures, people of all ages and ethnic groups smoke. But some patterns are evident. During the 1990s, the highest rates of smoking were among white high school students, and adults of Native American and Native Alaskan ancestry. In those groups, almost 40 percent smoked. African-American men were somewhat more likely to smoke than white men. Least likely to smoke were Asian-American women (about 6 percent). Among high school students, African-Amercan students' rate of smoking nearly doubled in the 1990s, alarming health officials. But even so, they were far less likely to smoke than white or Hispanic students. 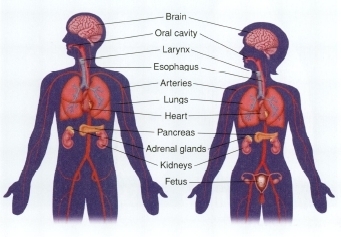 Parts of the body affected by tobacco in males and females. How Do Smokers Become Hooked? Tobacco contains a chemical known as nicotine (NIK-o-teen). Smokers can become addicted to this substance, which means they can become dependent on it physically and suffer unpleasant symptoms when it is taken away. For some people, the addiction * to nicotine is as strong as that to heroin or cocaine. In fact, when nicotine is breathed in cigarette smoke, it reaches the brain even faster than drugs that enter the body through a vein. What About Smokeless Tobacco and Cigars? Some people use smokeless tobacco, chewing tobacco, or snuff, because they think it is safer than cigarettes. However, tobacco is tobacco, and it can cause problems in any form. Smokeless tobacco can cause bleeding gums, tooth loss, and sores of the mouth that never heal. Eventually, it can lead to cancer. In addition, young people who use smokeless tobacco are more likely to start using cigarettes, too. Other people prefer cigars because of their glamorous image. However, cigar smokers, like cigarette smokers, have higher death rates from heart disease than nonsmokers. They are also more likely to get cancer of the mouth, larynx, and esophagus. What Health Problems Does Tobacco Cause? * addiction (a-DIK-shun) is a strong physical or psychological dependence on a physical substance. Bronchitis (brong-KY-tis) refers to inflammation * of the bronchial (BRONG-kee-al) tubes, the airways that connect the windpipe to the lungs. This leads to a cough that brings up lots of thick, sticky mucus * . About 14 million Americans have chronic * bronchitis, and smoking is by far the most common cause. 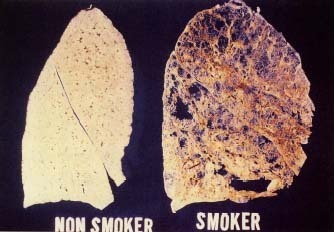 Healthy lung of a nonsmoker compared with damaged lung of a smoker. © O. Auerbach, Visuals Unlimited. Emphysema (em-fe-ZEE-ma) is a chronic lung disease in which the air sacs of the lungs are overly large. This condition makes the lungs work less efficiently and leads to shortness of breath. About 2 million Americans have emphysema, and most of these cases are caused by smoking. A heart attack occurs when the blood supply to part of the heart muscle is decreased or stopped. This happens when one of the large blood vessels that bring blood to the heart is blocked, usually by a buildup of fatty deposits inside the vessel. More than 470,000 Americans die each year from a heart attack. Smokers are twice as likely as nonsmokers to have a heart attack, and two to four times as likely to die suddenly of heart problems. A stroke occurs when a blood vessel to the brain is blocked or bursts, which can damage the brain. This is the leading cause of serious, long-term disability in the United States. Strokes also kill almost 160,000 people a year. Smoking raises the risk of having a stroke. Lung cancer kills more people than any other kind of cancer. Each year, more than 170,000 new cases of lung cancer occur in the United States, and about 160,000 people die from it. Smoking is the direct cause of almost 90 percent of all lung cancer cases. Cigarette smoke contains more than 4,000 different chemicals, and more than 40 of these have been shown to cause cancer in humans and animals. Smokers are more likely to get several kinds of cancer, including that of the mouth, larynx, esophagus, bladder, cervix, pancreas, and kidney. By far the best way to prevent tobacco-related diseases is never to start smoking. There is still good news for people who already are smokers, though. Those who quit, no matter how old they are, live longer than those who keep smoking. Quitting is hard. It usually takes people two or more tries to succeed. However, studies have shown that each time a person tries to quit, he or she learns more about what works and what does not. Eventually, all people can succeed if they really want to stop smoking. Half of all people who have ever smoked have quit. Some people see a health care provider or join a program to help them stop smoking. Three methods seem to work. Pick a quit date, and tell friends and family members of these plans. Write down all the reasons for quitting. Ask other people for their understanding. Ask friends and family members who are smokers to consider quitting at the same time. Get rid of cigarettes and ashtrays at home and in the car. Stay away from the smell of tobacco smoke. Think about past attempts to quit. Try to figure out what worked and what did not. Stop smoking completely on the quit date. Do not just cut back on smoking. People who try to smoke fewer cigarettes usually wind up smoking the same amount again soon. Keep a list of slips and near-slips. Look for patterns. Try to figure out what caused the slips and how to avoid them in the future. Be ready for short-term symptoms. Quitting smoking can lead to a dry mouth, cough, scratchy throat, and feelings of edginess. Get professional help, if needed. A doctor, dentist, therapist, or school nurse may be a good source of advice and support. Research shows that almost all smokers can benefit from temporarily wearing a small patch or chewing gum that contains nicotine. The nicotine passes through the skin and reduces the craving for this substance. Using the prescription patch or gum doubles the odds of success. A prescription nicotine nose spray is also approved for use in the United States. Personal counseling or a quit-smoking program can help someone learn how to live life as a nonsmoker. Studies have shown that the more counseling people have, the greater their chances of success. Look for a quit-smoking program that offers at least four to seven sessions over a period of at least 2 weeks. Friends and family members can also give support. In addition, self-help books and telephone hotlines may be helpful. 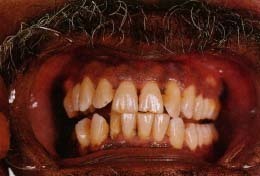 Teeth and gums of a smoker stained from tobacco. No one will want to kiss someone like this. People benefit from becoming aware of the things that make them want to smoke. For example, many people like to smoke when they are around other smokers or are feeling sad or frustrated. It is a good idea to avoid these situations as much as possible when trying to quit. To reduce stress, do physical things that are fun and healthy, such as going for a walk or bike ride. Keep the mind busy, too, to help control thoughts of smoking. Each day, about 3,000 teenagers start smoking regularly. However, most young people, 87 percent to be exact, do not smoke. More than four in five teenagers say that they would rather date a nonsmoker. About two-thirds of teenagers say that seeing someone smoke turns them off. Some problems, such as coughing, shortness of breath, nausea, and dizziness, begin with a person's first cigarette. Problems such as coughing and wheezing have been found in young people who smoke as little as one cigarette a week. About two in five young people who smoke say they have tried to quit but failed. Izenberg, Neil, M.D., with Robert P. Libbon. How to Raise Non-Smoking Kids. New York: Byron Preiss Multimedia Company, 1997. American Cancer Society (ACS), 1599 Clifton Road N.E., Atlanta, GA 30329-4251. ACS is a nonprofit group that sponsors the Great American Smokeout to help people quit smoking. American Heart Association (AHA), National Center, 7272 Greenville Avenue, Dallas, TX 75231. AHA is a nonprofit group that provides information on tobacco and heart disease. From the homepage, follow the links Family Health, Risk Factors for Heart Disease and Stroke That Can Be Changed, and Smoking. American Lung Association (ALA), 1740 Broadway, New York, NY 10019. ALA is a nonprofit group that provides information on tobacco and lung disease. Office of the U.S. Surgeon General, 200 Independence Avenue S.W., Washington, DC 20201. A government office that has issued several reports on the dangers of smoking. SGR4KIDS. A site for young people about the dangers of smoking from the U.S. Surgeon General. Office on Smoking and Health, National Center for Chronic Disease Prevention and Health Promotion, U.S. Centers for Disease Control and Prevention (CDC), 4770 Buford Highway N.E., Mail Stop K-50, Atlanta, GA 30341. A government agency that provides facts and statistics on tobacco-related diseases. U.S. Food and Drug Administration (FDA), 5600 Fishers Lane, Rockville, MD 20857. A government agency with a program to reduce tobacco use by children and teenagers. QuitNet. A site that helps smokers kick their habit and provides up-to-date news about tobacco. National Center for Tobacco-Free Kids, 1707 L Street N.W., Suite 800, Washington, DC 20036. A group that aims to protect children from tobacco use and secondhand smoke. Stop Teenage Addiction to Tobacco (STAT), Northeastern University, 360 Huntington Avenue, 241 Cushing Hall, Boston, MA 02115. STAT is a group that aims to stop smoking by teenagers and children. Action on Smoking and Health (ASH), 2013 H Street N.W, Washington, DC 20006. ASH fights smoking and supports the rights of nonsmokers. Smoke-Free Kids and Soccer. A site that urges girls not to smoke and to stay physically fit through soccer. Americans for Nonsmokers' Rights (ANR), 2530 San Pablo Avenue, Suite J, Berkeley, CA 94702. A group that fights smoking and supports the rights of nonsmokers. Avoid places where people are smoking whenever possible. Encourage smokers to quit for their health and yours. Prevent children from regularly being exposed to smoke. Encourage restaurants, stores, and other social settings to provide nosmoking areas.